Many users like to consolidate all their other email accounts, contacts, etc into Gmail for easy coordination and reference. 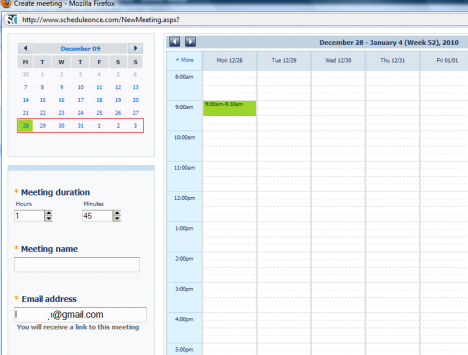 If you are a Gmail devotee, ScheduleOnce’s Firefox add-on, Meeting Scheduler for Gmail, is worthwhile looking at if you want to add in additional secretary features in Gmail to assist you on meeting scheduling and coordinating. Invitees will receive an email from the meeting organizer about the upcoming meeting. They can reply with their tentative availability so that the organizer can evaluate the invitees’ availability and reschedule accordingly. Users who have Google Calendar account can also connect ScheduleOnce’s Meeting Schedule to their GCal account for better event planning and scheduling.